Grape Seed Extract 150mg 120 caps. Take 2 veggie softgels a day with a meal or regardless of a meal or as directed by your healthcare practitioner. The supplement is based on a natural plant extract with proven hypotensive effect. Preventively, take 2 capsules per day. 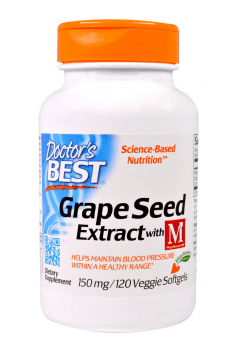 Grape seed extract contained in the supplement is soluble in water, therefore the supplement does not need to be taken with a meal. The preparation should not be combined with synthetic pharmacological agents used for hypertension. It is recommended to regularly monitor blood pressure during supplementation.